A stamping friend sent me some Hot Off The Press "Dazzles" "Stitched Stickers" and they looked really cool so I had to play with them right away! 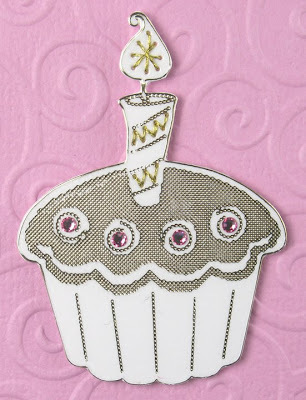 I thought about sticking the cupcake on a colored cardstock, but then decided to go with white - I think the gold on white is really elegant! You can see the stitching on the candle bottom and flame. There were supposed to be french knots inside of each of those little swirls, but I went with bitty pink rhinestones instead. I'm so glad I got to try these - they are pretty neat and fun to play with! I have another one all stitched up that I need to put on a card. I'll post it soon. If you're interested, you can order these from Paper Wishes. The sentiment is from Cornish Heritage Farms - the Tag! You're It! set from the Kim Hughes Collection. TFL! You can see that I pretty much copied the card exactly with only a couple very minor changes. I used Sheriff Ian for the first time and some really old Cosmo Cricket papers from their Wanted line. 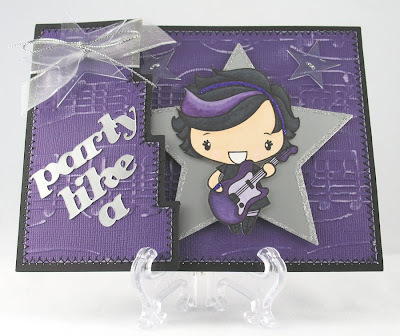 That cute little star embellishment actually came in a page kit with the Cosmo papers - isn't it just the perfect little accent? The sentiment is from the McSplendid Farm set. I'm not sure where those metal corners came from - I've had them in my stash forever. Yay for using old stuff!! As for making the card, Ian was stamped on white cardstock and colored with Copics. 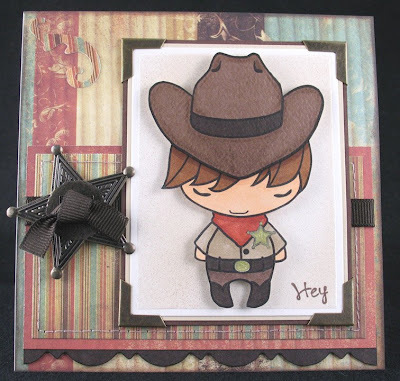 I stamped just his hat area on a textured brown cardstock and colored the band with a dark brown Copic, then did just a little shading with chalk. I cut all around Ian, then added the hat, just popping up the top portion. The cream panel was airbrushed with 2 shades of brown; the darker one was done kind of spotty for more interest. I also stitched around the smaller striped panel and colored the white thread with brown chalk because I don't have any brown thread. I can't wait to see what everyone else comes up with! TFL! So if this is you, please email me with your snail mail and I'll get your Bellas mailed out ASAP!! If I don't get a response within a week, I'll pick another winner! 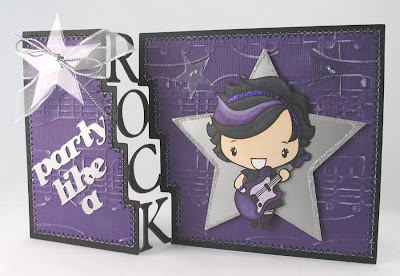 The first four-letter word that popped into my head was "rock," so my next thought was Rockstar Anya from The Greeting Farm, and she was a perfect fit! 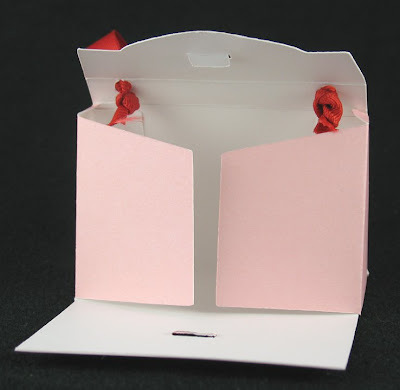 When folded flat, the card is 4 1/2" x 6". I recently got a box of envelopes that were labeled invitation size, but are actually a little larger so that you can fit a 4x6 picture inside. I figured I might as well take advantage of that extra space! I also used Diane's idea of cutting a separate front part to emboss, but I made it just a little smaller all around to give me a border. 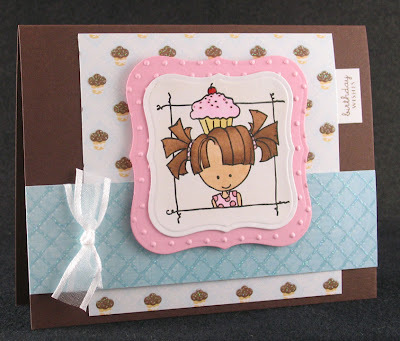 I also did a piece for the back and embossed both with the Cuttlebug Allegro embossing folder. Then I distressed both pieces and sewed them on with a zigzag stitch. I'll probably skip that step next time since it was really time consuming going around all those steps! The "party like a" was done with the Hello Kitty Font cartridge and the big star was done with the biggest of the star Nestabilities. I went over all the edges of the ROCK with a stardust glitter pen and I edged the star with silver glitter glue. The final touches were some Heidi Swapp ghost stars, a little silver edged organdy ribbon and silver cording. I just love how this came out and will definitely make more! A huge thanks to Diane at Capadia Designs and to Lacy for suggesting the idea!! 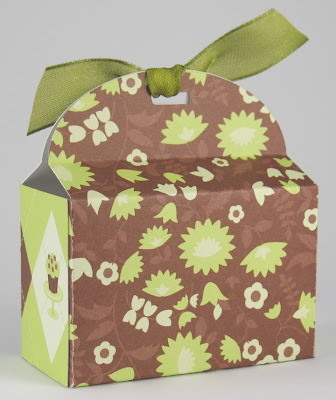 Lauren Meader has been showing samples of her soon-to-be-released My Timeless Template called the Rounded Wrap Up Box, and the more wonderful creations she showed, the more I wanted to make one! Of course I had to do it in Cricut Design Studio (because I am obsessed with making things in it! 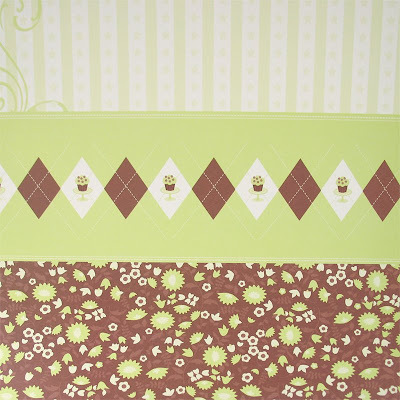 ), and I also wanted to showcase some of the awesome patterned paper I have, specifically from the DCWV Sweet Stack (the 12x12 version). My box is 3" wide, 1.5" deep, and about 3.25" tall. I modeled most of the measurements after my treasure chest boxes, and then adjusted whatever looked funny. 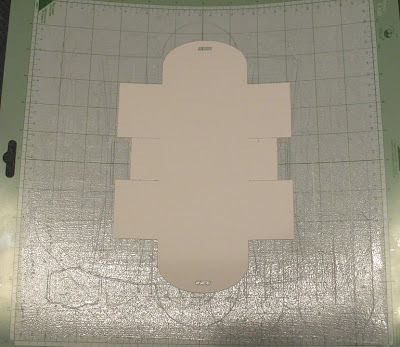 After creating and testing the DS cut file, I had some plain white cardstock with the shape of the box cut out of it. Instead of trashing it, I kept it to use as a placement template. and laid my placement template over it, positioning the template so the cupcake would be centered on the front of the box. Then I made marks on my PP where the edges of the template were and cut on the marks on all 4 sides of the PP to get a sheet 8x9.5". Next, I simply placed my PP face down on my Cricut cutting mat exactly how the white cardstock had been placed and hit cut. I also created a separate page in the same file to make the score lines, so I had to adjust my blade depth and pressure and hit cut again. You can see that I also put a couple little slots on the cut file to tie ribbon through. Then I just folded on all the score lines, glued it together, and added a little ribbon. 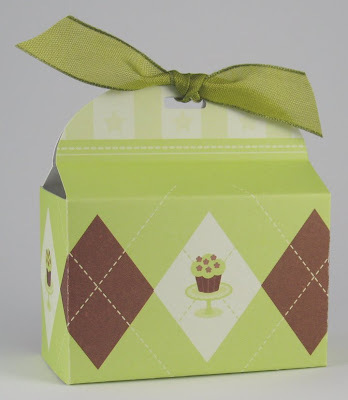 I love how the pattern on the paper is perfectly placed on the box, and makes it look like I actually took the time to decorate it! 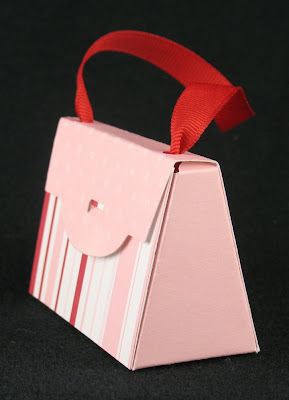 I hope you like my little box, and don't forget to check out Lauren's blog and all of her My Timeless Templates at Papertrey Ink! Thank you so much to Lauren for all of her creativity and inspiration!! 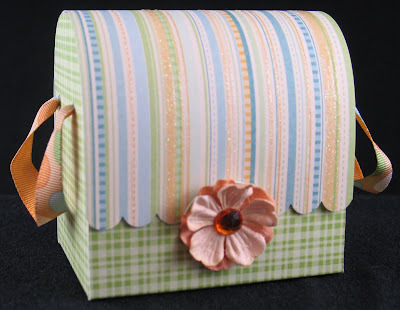 ETA: After a few requests, I have uploaded the .cut file for this box. If you like it, please let me know by leaving a comment. Also, if you make anything with the file, I'd love to see it! 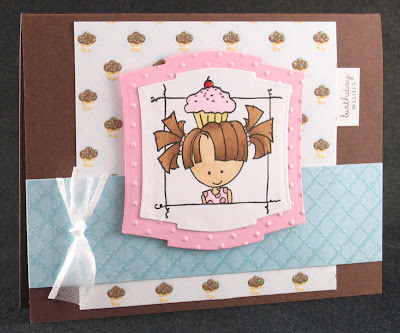 For today's card, I used Laura's Sketch 19 from the 2 Sketches 4 You blog. 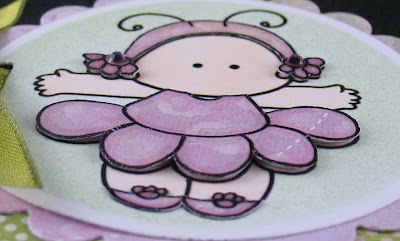 I also used one of my new Huggabuggs from Stamping Bella - Beeemine. She is just too cute - love her!! I stamped and colored her with Copics first, and then decided I wanted a black and white color scheme so I dug out this old Doodlebug patterned paper and some black cardstock. 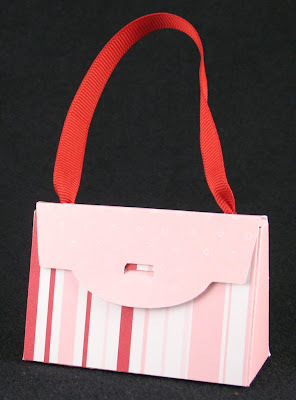 At first I was trying out some really wide red ribbon for that strip down the center, but the bows were way too big for this little image, so I came up with the swirly cardstock strip. Again, I tried red, but then decided if the heart was the only red, it would pop more, so I added the yellow strip instead, with white ribbon and a white button. Hope it works. TFL! Renae over at Two Scoops Rice Designs was so generous to give out a free digi image recently and it's so cute I had to make a couple different cards! For both cards I paper pieced the fairy's outfit. It's a little more complicated doing piecing with digi images, but it's still very doable. I just printed the image onto regular printer paper, and then taped my piece of patterned paper over the image on all 4 sides. Then I just stuck the paper back in the printer tray and printed again. Since the image can print in a slightly different spot, I made sure my patterned paper was bigger than my image on all sides. I also stuck a piece of Eclipse masking tape over the image to create a mask for airbrushing. Lastly, I also printed the image a couple times on plain white cardstock to serve as my base for the fairies. Unfortunately, when I was cutting and shaping my PP pieces, the toner did flake off a little so I had to go over some of the lines with a pen. I had much better results when cutting the mask, so I think the PP I used was just too thick (Memory Box PP is like cardstock). 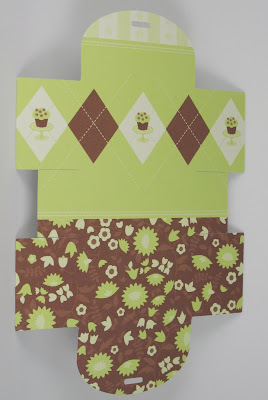 For both cards I popped up just the "petals" of the skirt with 1/4" hole punches of scrap cardstock and the flowers on the hat with 1/8" hole punches for dimension. You can see in the close shot that I added a couple of purple rhinestones to the flowers on the hat. For the second card, I added stickles to the flowers on the hat and shoes for a little sparkle. On both cards, I went over all of the outfit lines with a Stardust pen, but it's really hard to photograph. All the letters are from Making Memories - Silver letters are Cheeky Shimmer Stickers and the rub-ons are Simply Stated Heidi font. 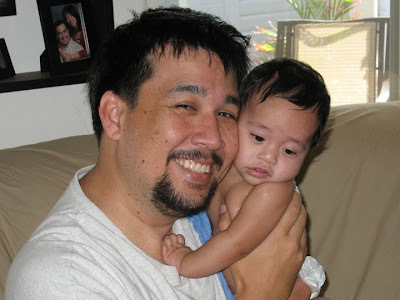 This is my handsome hubby holding one of our sons (and isn't he even more irresistable holding a cute baby?). P.S. A couple more things that are so great about him - he can stamp (see this post), and he actually reads my blog, so this is for him: "I love you honey!! You ROCK!!" 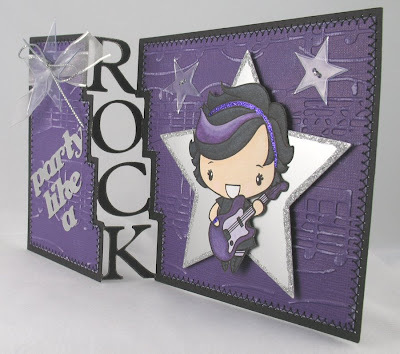 It's been a while since I posted a Stamping Bella card, so here are a few I've done lately. 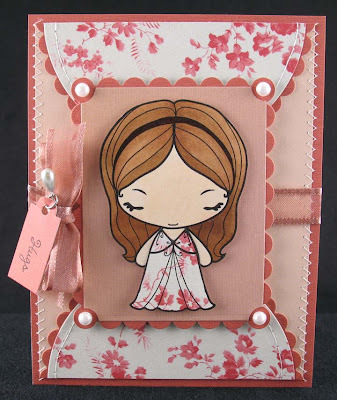 I used Daisybella for this card, along with a couple of sheets of gorgeous Memory Box Sprout patterned paper. I'm not sure which Nesties shape I prefer with this image. Although I really like the shape of the first one in general, I think the second shape really goes well with this particular image. The paper is from the DCWV Sweet Stack and the sentiment is from one of my fave Papertrey Ink sets - Mixed Messages. 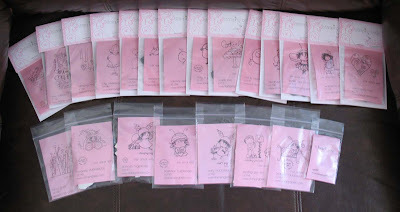 Now onto the blog candy part (I'm sorry it's taken me so long to post this! ): A while ago, I won the most INCREDIBLE blog candy from Em on the Stamping Bella blog - one of EACH of the new stamps released at the beginning of January!! I thought it was going to be 5-7 stamps, but it turned out to be 24!! HOLY CROW!! Em is the queen of generosity, yes?! Here's a picture I took of the haul - you can see I was so excited that I started ripping them open before I even thought to take a picture! Well, since I haven't even mounted all the stamps I got from my Bella's anniversary order and I just had to place an order last night for some of the brand new releases, I knew I would never give all these fine stamps the loving they deserve. So I've gone through the collection many, MANY times, and picked out 5 that will go on to a better home through my first ever blog candy giveaway! The 5 are Lilly Loveaboo, cuddly owlies, twinkle toes huggabug, hanging heart block, and love collage. If you're interested in winning, please leave me a comment at the end of this post, and tell me what your fave Stamping Bella image is. I know it's really hard to narrow it down to just one, so if you want, you can name several! I will pick a winner at random on Monday, February 16, 2009 at 12:01 am Hawaii time. I have to say that right now I'm really loving Is that a cupcake on your head? because I'm obsessed with cupcakes and it's just so cute!! Now it's your turn! I adore paper piecing the clothes in the Dress Me and Wardrobe #1 sets for Anya - it's just too fun! I think this dress below is my fave outfit (with the short dress in a close second place) so far. I can't wait to see what outfits she'll have in the future! I've been trying to use up some of the really old supplies I have, so this is a bunch of stuff from Making Memories that I got in a kit years ago (plain and patterned papers and pearl pin). I also added some May Arts ribbon and some half pearls. The little tag was cut with a Cuttlebug die and the sentiment is from the Panda Friends set. TFL! 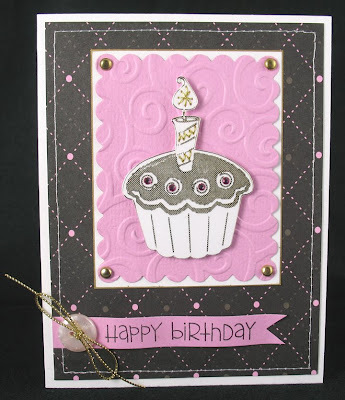 I thought that with the darker colors, this might be a good masculine card, but by the time I added the scallops and dot embossing, I think it's looks a little more feminine, so now I'm not sure! 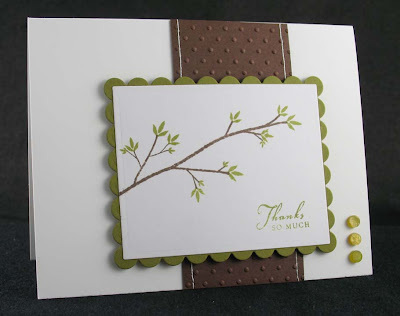 I used one of my fave PTI sets - Out on a Limb (but I have the older version that included the smaller sentiments). I used Ripe Avocado and Dark Chocolate, and those little accents are Bella's Dots. I really like this clean and simple layout so I think it might end up in my sketch binder. Hope you like it too! 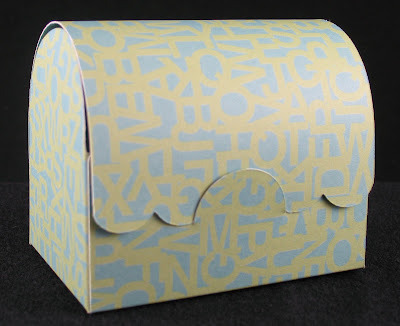 After I saw this super cute treasure chest project, I knew I had to try and recreate it for the Cricut. I used Plantin Schoolbook for all of them. After I assembled the pieces (there is a base piece and another piece which forms the lid), I decided to add handles, so I punched 2 holes on each side and added 2 bits of ribbon. 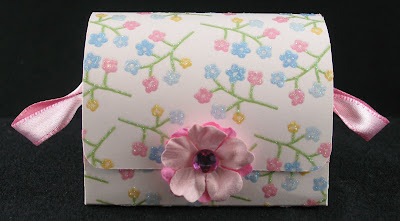 I also embellished with a couple of Prima flowers and a Doodlebug rhinestone. I left this box undecorated so you could see the modification I was talking about earlier - I added a half circle slot so that the lid can just be tucked in to hold the chest shut instead of adding velcro. The original chest was 3" tall, and this chest is 2.5" tall. As you can see, I hid the half circle closure with Primas and added handles again. 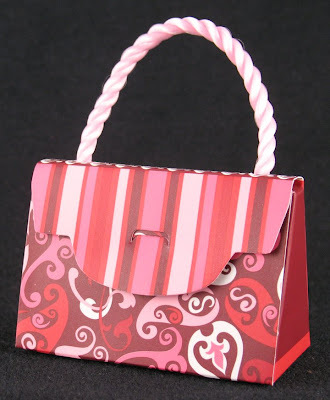 By using patterned paper for the chest, I think it barely needs decorating at all! Hope you like them and a big thanks to Katie Rentz for the original project! ETA: After several requests, I've made the .cut file available for download. If you download the .cut file for this project, please also download my notes file!! I've only included the .cut file for the 2.5 inch chest (the middle one) because that's my favorite size and shape! Here are the links to the .cut file and the notes file. If you like the project, please let me know by leaving a comment. Also, if you make anything with the file, I'd love to see it!